It's what every driver of a modern diesel car doesn't want to see glowing on the instrument panel - the dreaded DPF warning light. Replacing with a new unit can be an expensive business, and removing the DPF is now against the law in most circumstances and could lead to prosecution. Our new 11-stage process, using patented, proven technology offers a much more cost-effective and environmentally friendly solution. Our research & development testing and in-house results have shown between 96-100% of accumulated ash/soot in the DPF are removed, the DPF returned to “As New” condition and the back pressure generated by the filter is restored to factory specifications. Our facility is high capacity, which means that we can also refurbish very large diesel particulate filters from HGV's, static plant, industrial and power applications including specialised equipment for the oil and gas industries. 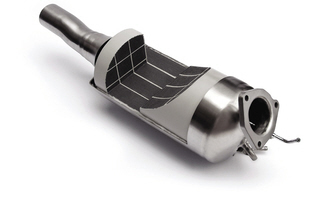 DPF Deep Clean provides DPF cleaning for nearly all DPFs on the market today as well as catalytic converters and EGR valves,for all types of vehicles and equipment: cars, commercial vehicles, plant and equipment and industrial applications. Engineering Directory - Directory listing UK engineering companies.